NEW YORK – Thousands of people gathered at the beautiful South Street Seaport in New York City Oct. 7, enjoying songs, dances, and fireworks which were part of the Diwali festival hosted by the Association of Indians in America, NY Chapter (AIA-NY). 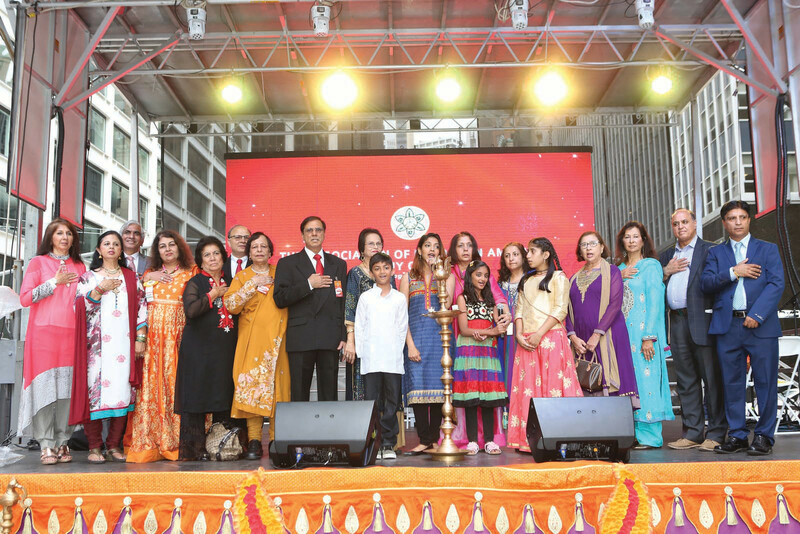 This was the 31st Annual Deepavali Festival organized by AIA which is considered one if not the oldest Indian-American organization in the country. 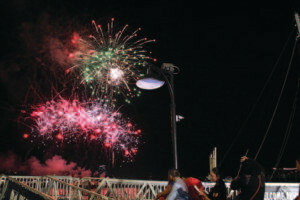 Festivities went on from noon till 7pm, organizers said in a press release, with Indian culture, food, heritage, live performances and a spectacular fireworks display. 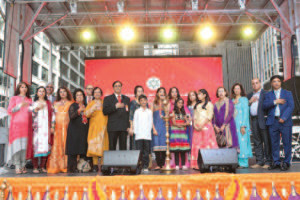 AIA members, including President of AIA-NY, Gobind Munjal, at the lamp lighting ceremony of the Diwali mela at South Street Seaport, in New York, on October 7, 3018. 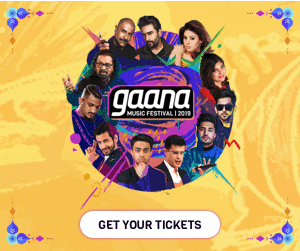 The highlight performances were by British-Asian superstar Jaz Dhami; Bollywood playback singer, Shilpi Paul; Indian TV actors, Aman Dhaliwal and Karan Khanna; local NYC singer G. Sing and popular Gujarati Band all the way from India, KB Music, with their lead vocalist, Jigardhan Gadhavi. 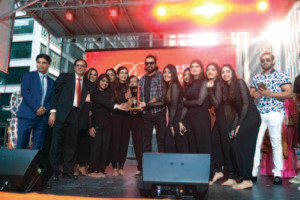 The highly competitive inter-collegiate dance contest, Naach Inferno, presented by Star Bharat, in its fifth year saw first-time entrants East West Dance Academy beat the other accomplished teams. 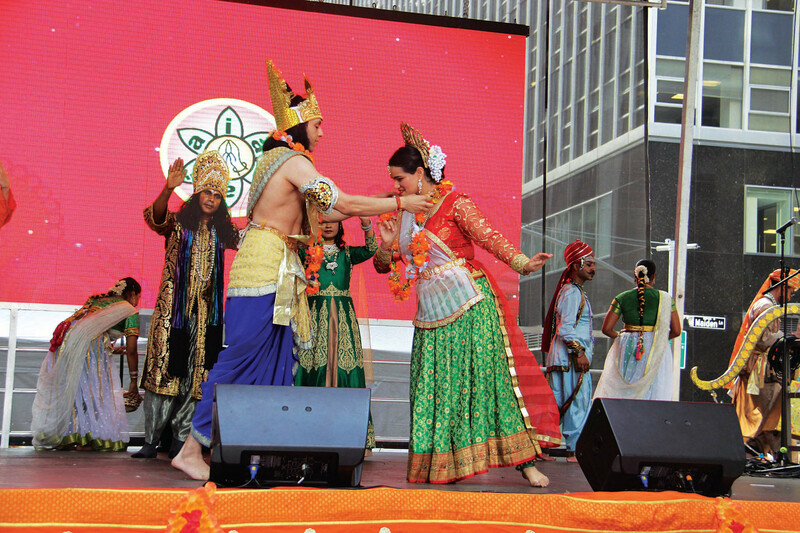 Ramayana enactment on stage at the AIA Diwali mela at South Street Seaport, in New York, on October 7, 3018. The group SA Grooves alongside its founders, Tanya Thanawalla and Asees Singh, brought the audience to its feet with their Bollywood moves. Jaz Dhami had the crowd at South Street Seaport clap their hands in their air as he performed his song ‘High Heels’ and many more. Judges of the dance competition, at the Diwali mela. Shilpi Paul also had the audience which was made up of families and the young and old alike, dancing to her tunes, on and off the stage. Paul and Dhami’s performances were presented by Sony TV. 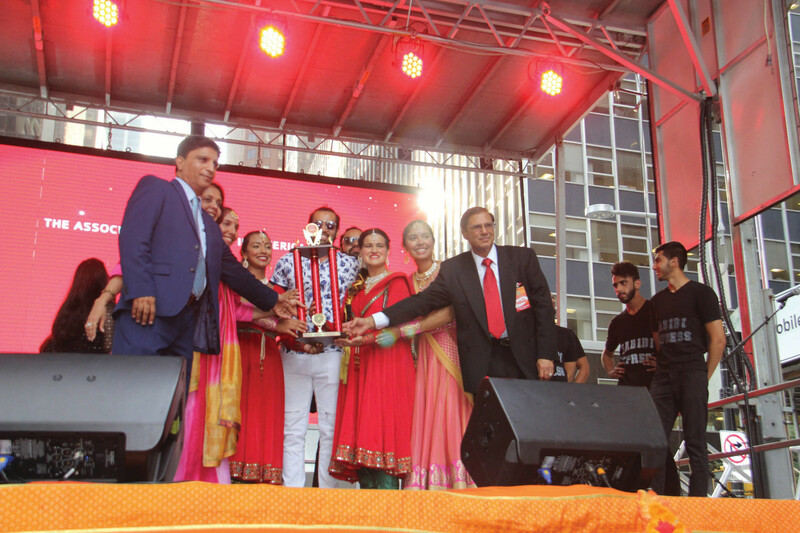 Aman Dhaliwal with the runners-up of a dance competition held at the AIA Diwali mela at South Street Seaport, in New York, on October 7, 3018. 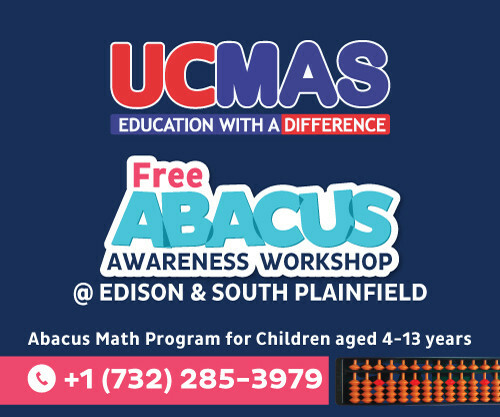 Although the Festival caters to all ages; children, youth, middle aged and the seniors. The emphasis recently has been shifted more towards youth, as their involvement is considered essential for the longevity of the association, the AIA said in its press release. 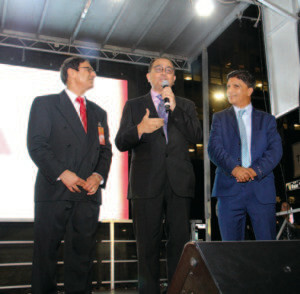 AIA-NY President Gobind Munjal (left), the Consul General of India in New York Sandeep Chakravarty and Harish Thakkar, at the Diwali mela. 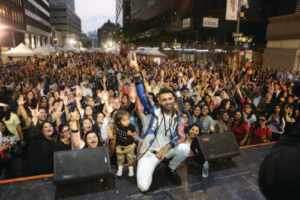 Gobind Munjal, the current president of AIA-NY launched “Desi Next” with that objective in mind, selecting activities geared toward the younger generation, including bringing young artists to perform at the festival. “AIA’s goal to incorporate more young adults into the mainstream activities of the community was accomplished,” Munjal is quoted saying in the press release. The first place winner for dance competition getting their prize from Aman Dhaliwal. Several dignitaries spoke at the event, among them India’s Consul General in New York, Sandeep Chakravorty; Congresswoman Carolyn Maloney, D-New York District 12; Manhattan Borough President Gale Brewer; New York City Comptroller Scott Stringer, and former Comptroller John Liu graced the occasion. Fireworks on the East River illuminated the New York City skyline and served as the grand finale. They were sponsored by CheapOair and Qatar Airways, organizers said. Shilpi Paul singing at the AIA Diwali mela. Other corporate sponsors included McDonald’s, Pepsi, New York Life, and Kotak Mahindra Bank. 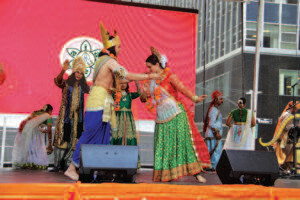 The Association of Indians in America which has over the years, made this Diwali celebration part of the social fabric of the Big Apple, was founded on Aug. 20, 1967. It is the grassroots national organization of Indian-American immigrants in the United States, the press release said, with chapters and membership spread across the country. The fireworks display was a huge attraction at the annual AIA Diwali mela.